Most travelers to Mexico think of the country’s culture, heritage and beautiful coastal regions when they consider vacations, but there’s more to Mexico than meets the eye. Those willing to venture beyond resort life can discover Mexico’s adventurous side, splashed with color, culture and creativity. As we approach Halloween in the U.S., Mexico is readying for one of its most colorful annual celebrations, Dia de Los Muertos or Day of the Dead. There are celebrations throughout the country on November 1, particularly in the southern and central regions. Those looking to honor the holiday can head to San Miguel de Allende, where there is a weeklong public party. In Mexico City, head to the community of San Andres Mixquic in the southeast of the city or visit the canals of Xochimilco. Dia de Los Muertos is also one of the biggest annual celebrations in Oaxaca. 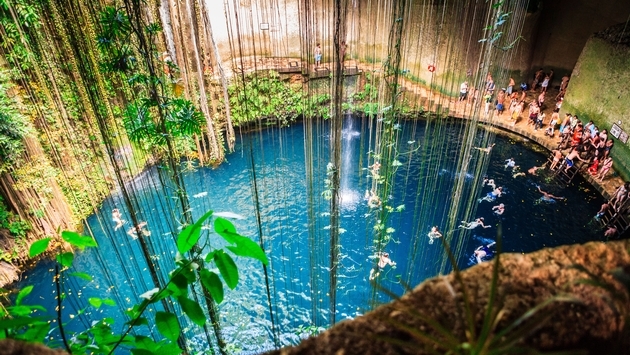 Swimming in a cenote is an iconic Mexico activity. Cenotes are natural sinkholes, resulting from the collapse of limestone that exposes underwater rivers. They are especially associated with the Yucatan Peninsula in Mexico and swimming in one is a unique activity for visitors in the region. Cenotes can be beautiful and otherworldly like the Cenote Ik Kil, with ethereal vines dipping into the deep blue water and Tulum’s Cenote Sac-Actun in an underwater cave along the Caribbean coast. Los Cabos is where the ocean meets the sea but it’s also where action and adventure blend with relaxation and luxury. While water-based pursuits are refreshing, there are a number of land-based experiences that are unique to the region, blending the desert-like landscape with a beach-life experience. See the shoreline from the back of a camel, horseback ride through the desert, visit the Animal Kingdom Sanctuary, ride ATVs, take a moonlit zipline, bungee jump over a canyon and more with Wild Canyon Adventures, which specializes in adrenaline-pumping thrills. Off the beaten track, travelers could find their way to the southern Mexico State of Chiapas, setting up a base in the colonial city of San Cristobal de las Casas, adventure awaits in the El Ocote Biosphere Reserve, where visitors will find activities such as waterfall jumping, river rafting and rappelling. For a unique experience, travel to the western part of the state to the Sima de Cotorras Ecotourism Center, which was established by a group of local Zoque families. The group works to preserve the surrounding environment as well as provide opportunities for tourism, including rappelling into a sinkhole where visitors see cave paintings, tropical vegetation and local parakeets. For visitors who really want to take their Mexico visit to the limit and see a lesser-known part of the country, hiking El Pico de Orizaba will be on the top of their list. The mountain is the highest in Mexico, the third highest in North American and is the crown jewel of Mexican volcanoes. Trekking enthusiasts can join an expedition to the top of the peak which sits at around 18,000 feet—sure to take your breath away in more ways than one.